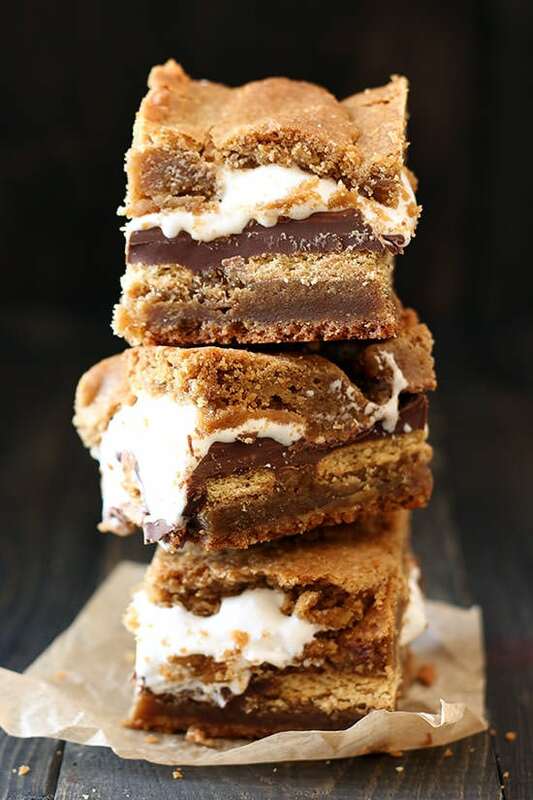 Peanut Butter S'mores Blondies have a layer of graham cracker, Hershey's chocolate bars, and marshmallow fluff stuffed between two layers of chewy peanut butter butterscotch blondies. Taste: Signature s’mores flavor that we all know and love, with the marvelous addition of butterscotch and peanut butter flavors. Texture: The texture is indescribably awesome. Chewy, ooey, gooey, crunchy goodness. Appearance: Messy but oh so mouthwatering. 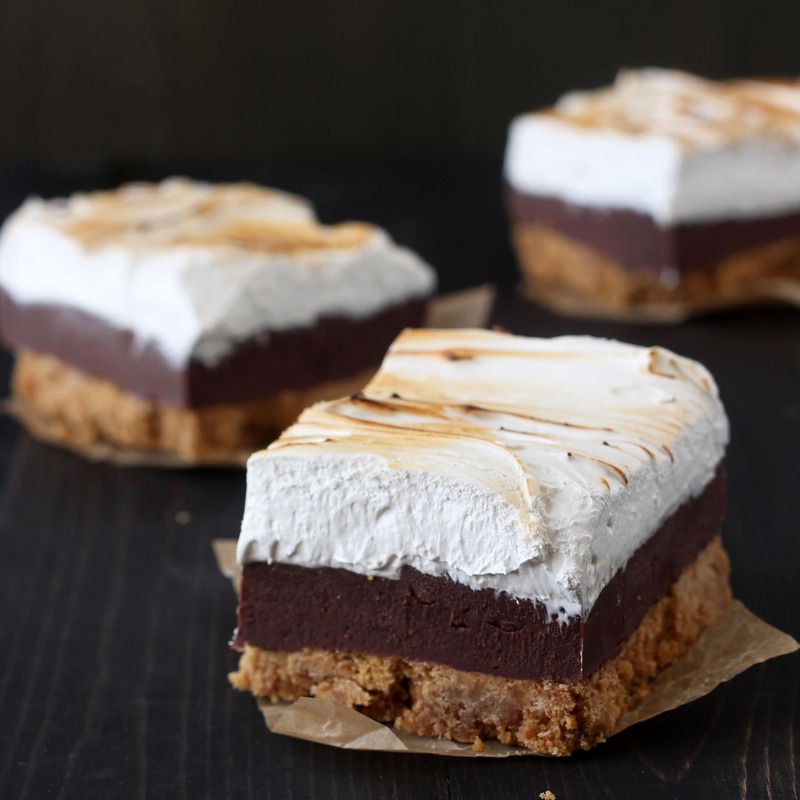 Pros: Amazing twist on s’mores that everyone will love. As a chef, recipe developer, or food blogger, you always look out for certain reactions when people taste your food. 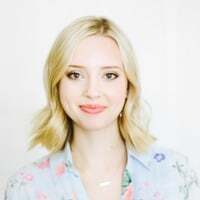 Everyone always tries to be nice and polite, of course, but you can’t fake the enthusiasm, surprise, and joy people naturally express when they eat something they absolutely adore. That is music to my ears! 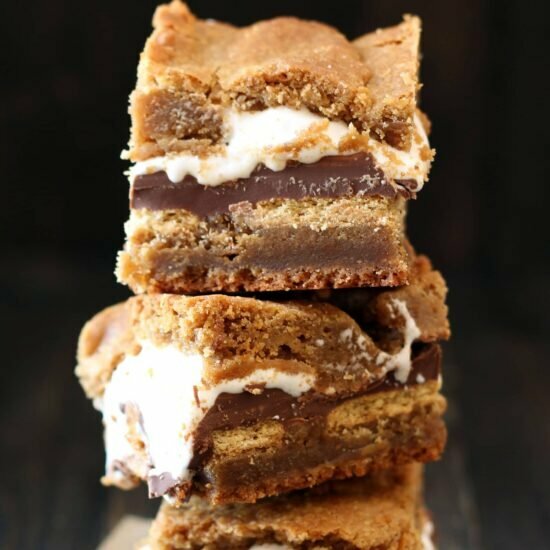 I knew I had to share this recipe with you guys ASAP, if you’ve got any s’mores lovers or peanut butter lovers in the family they will adore these Peanut Butter S’mores Blondies. The blondie itself is so beautifully chewy with a perfect balance of sweet butterscotch and nutty peanut butter flavors. That combined with the sticky, gooey, and crunchy s’mores filling is to die for. The bars are a little messy, but in the best possible way. To get cleaner cuts, refrigerate the bars before cutting. You can microwave them to get that wonderfully gooey middle. 1. Preheat the oven to 350°F. 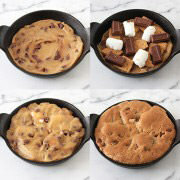 Line an 8x8-inch pan with foil, leaving an overhang on all sides, then spray with nonstick baking spray. 2. In a saucepan over medium heat, melt the butter and brown sugar, stirring constantly until smooth. Remove from the heat, and stir in the peanut butter. Allow to cool while combining the flour, baking powder, baking soda and salt in a large mixing bowl. 3. Add the eggs to the cooled peanut butter mixture, one at a time, mixing well after each addition. Add the vanilla extract and stir to combine. Pour the mixture into the prepared dry ingredients, and stir to create a thick, smooth batter. 4. Divide the dough in half and press half into the prepared pan, spreading evenly to the edges of the pan. 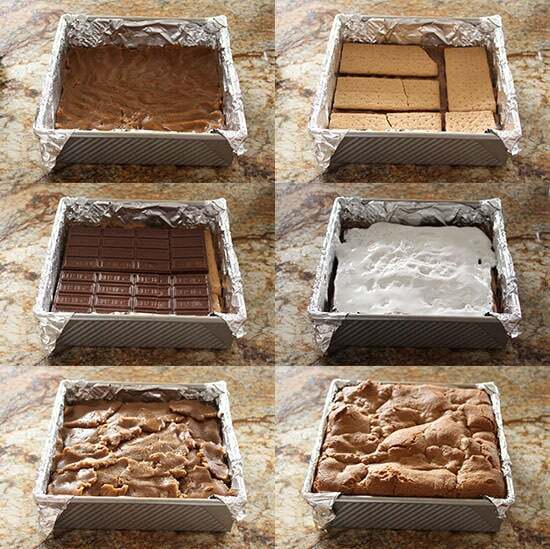 Place the graham crackers then the chocolate bars over the dough. Spread the marshmallow crème evenly over the chocolate. Scoop out balls of the remaining dough and flatten completely. Top the marshmallow crème evenly with the flatten dough to cover completely. 5. Bake for 30-35 minutes until the top is golden and the edges are slightly browned. Allow to cool in the pan. Cut into 1-2 inch squares and serve. 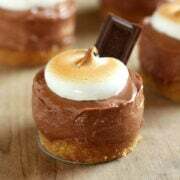 These looks yummy, I’ve got to try this Pinned! These are mouthwatering. I hope there’s a Youtube video coming out! 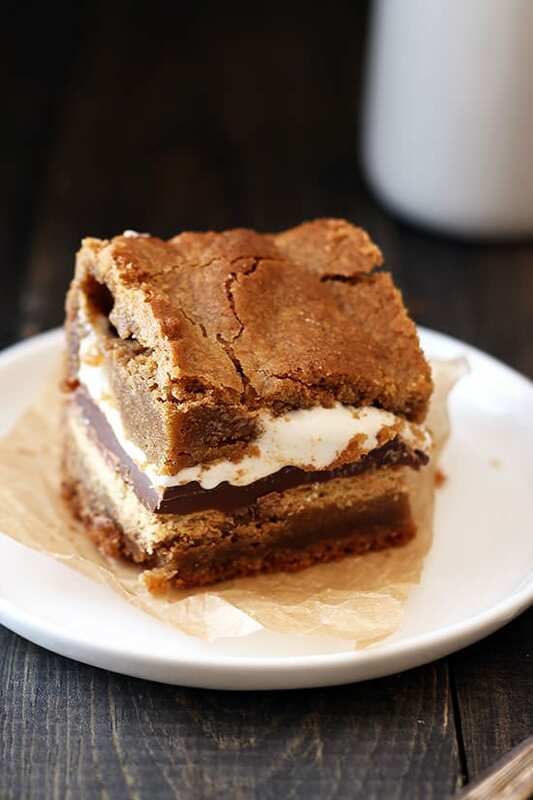 The Peanut Butter S’Mores Blondies recipe is a bit unclear. I believe the eggs and vanilla are supposed to be added to the sugar/peanut butter mixture. Then, that mixture is stirred into the dry ingredients. Just put them in the oven–can’t wait to try them! These sounds SO GOOD! So exactly my kinda treat. Totally irresistible! I want these now! I’m loving every layer of these delicious bars! Mine are in theoven now but used a 9x 13 glass pan and they are slowly baking overthe edges! I doubled the recipe for a tailgate. Help!! Maybe that was stupid…. Baked these the other night for a friends bday… Everyone LOVED them!! I did have to bake them about 10 extra mins and was still concerned they were not cooked all the way through but they were gone so fast, no one seemed to mind. Def gonna make these again!!! Do you refrigerate the leftovers? Just made them and they are fabulous!! I just stored them in an airtight container at room temp! The recipe says to grease the pan but the pictures show a foil-lined pan. Do you line with foil, then grease the foil? I sooo wanna make these but don’t have Hershey bars! Only have morsels… how can I substitute to make this deliciousness NOW!?!?! I made thee today for my book-club gals and they LOVED them! I do have to say that mine weren’t quite as pretty as yours, but they were delicious! Thanks for a great recipe! I made these today and found that there was too much blondie which resulted in the finished squares being really tall/thick. I don’t think the graham crackers are really necessary because the taste blends in with the taste of the blondie and isn’t really distinguishable in the finished product but also the graham crackers don’t really melt into the squares so my squares ended up wanting to separate into top and bottom halves. If I make this again I’ll use less blondie mix (or a bigger dish) and I’ll skip the graham crackers. Can the blondies be frozen?